The best thing about the latest, 11th by a comprehensive count, and (let’s be honest here) probably not final Halloween movie is John Carpenter’s new score. The director-composer has returned to the franchise to offer a fresh arrangement of the iconic tinkle of piano he laid down for his 1978 slasher masterpiece, and it kills—distorting those same repeated notes into something familiar but still a little foreign, building out from the theme’s simple core with new instrumentation, amping up the dread with an otherworldly blare that occasionally reminded me of the menacing whale-songs passages of the Hereditary score. Listening to the new music, I kept anticipating something comparable from the movie itself: a remix that held the soul of the original intact, in a way the other sequels, remakes, and reboots never really have, while still bending it into a new, ahem, shape. 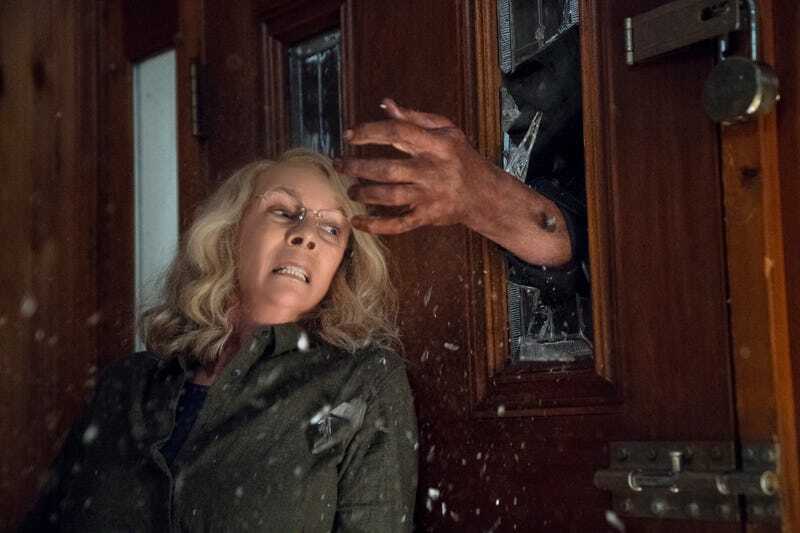 Sadly, for all the hype its built around itself over the past few months, Halloween (Grade: C) is just another pale imitation, another bad Halloween sequel watering down the fear factor of the original. And as for the much-ballyhooed final showdown it arranges between Laurie Strode and Michael Myers: We’ve been down that eerie suburban street before, too, haven’t we? Directed by David Gordon Green (Stronger, Pineapple Express), who co-wrote the screenplay with Danny McBride, Halloween nods to multiple entries in the series, while also retconning the plots of all but the first movie. (Yes, even the second gets blipped from the continuity, along with Laurie’s blood relation to her stalker, which one of the film’s sub-Scream class of self-aware teens confirms aloud.) Taking a page from Terminator 2, Green and McBride present Strode (Jamie Lee Curtis, in her fifth go at the role, if you count the insult that was Resurrection) as a paranoid, trauma-hardened survivalist who’s spent every day after that fateful night in Haddonfield 40 years earlier waiting for Michael’s return—a lifetime of preparation that’s forced a wedge between her and her adult daughter (Judy Greer) and teenage granddaughter (Andi Matichak). As dark fate and screenwriter contrivance would have it, they’re moving Michael to a new asylum on Halloween night (why do they always move him on Halloween? ), and the unspeaking madman is in a mood for a reunion tour of his old haunts, thanks in part to the taunting of a pair of annoying, exposition-facilitating British podcasters chasing that true-crime bank. Oblivious teenagers, a masked madman among the trick-or-treaters, a lawman and a psychologist running around town in not-too-hot pursuit: Halloween conforms to the basic pattern most of these movies follow, returning to Haddonfield as mindlessly, even mechanically, as Michael does. Green, who’s surely the most respected, accomplished director to ever make a Halloween sequel, has some occasional fun aping Carpenter’s voyeuristic camerawork; there’s a great long take that tracks Michael up to a window, loses him as he goes around the side of the house, and finds him again when he appears behind some poor, unsuspecting knife fodder inside. But Green seems equally indebted to the gorier, meaner, less suspenseful approach of the other sequels and Rob Zombie’s remakes, as though he were constructing a kind of greatest-hits package for a band unwilling to admit that they have only one album people really want to hear. Halloween isn’t explicitly a horror-comedy, but it does have the destructive habit of undercutting its scares with broad laughs, Green and McBride deflating the tension at every turn with goofball asides. I’m never going to complain about seeing Curtis reprise her quintessential scream-queen role. There’s juice in the conception of Laurie as someone reborn through terror, someone so haunted by one soul-shaking trauma that she’s spent her whole life transforming herself from victim to fighter. And the final act, which involves what Matichak described as the “generational angle” of the material, is crowd-pleasing in the right and even resonant way. But, again, hasn’t this series gone there before? I can’t help but think of Halloween H20, one of those other, generally maligned Halloween sequels that the new one wants you to forget about. That was a flawed and much more workmanlike movie, but it handled essentially the same dramatic scenario—Laurie in wait, locked in the grip of her memory and fear of Michael Myers—in a much more nuanced way. It didn’t just set up a final title match; it made you believe in the reality of what Laurie’s life has become. Judging from the response last night, plenty will get what they want out of Halloween’s ending, but I’m not so quick to forget the franchise’s ideal conclusion, which arrived with a swift swing at the close of H20. It’s everything that’s come afterwards I’d prefer to retcon.